Liverel is the first and only supplement to combine Artichoke Extract with N-acetyl Cysteine, Choline, L-Carnitine and L-Glutathione, as well as other vitamins and trace minerals. Liverel is an advanced formula with Artichoke extract which may contribute to the maintenance of normal liver function and normal digestion. Provides vitamin C, zinc and selenium which contribute to the protection of cells from oxidative stress, together with vitamin D which contributes to the normal function of the immune system. Liverel provides thiamine (vit.B1) and folate which contribute to normal energy-yielding metabolism. Take two tablets per day with your main meal. Swallow with a glass of water or a cold drink. Not to be chewed.Do not exceed the recommended intake. Bulking Agents: Microcrystalline cellulose, Pregelatinised Starch, D-Calcium Phosphate, Vitamin C, Tablet Disintegrants: Crosslinked cellulose gum, Polyvinylpolypyrrolidone, Potato Starch, Vitamin E, N-Acetyl Cysteine, Choline Bitartrate, Inositol, L-Carnitine Tartrate, L-Ornithine Hydrochloride, L-Lysine Monohydrochloride, Zinc Sulphate, Lubricants: Stearic Acid, Magnesium Stearate, Magnesium Silicate Prep, L-Glutathione, Binders: Ethyl cellulose, Polyvinylpyrrolidone, Panothenic Acid, Thiamin, Vitamin B6, Niacin, Ferrous Fumarate, Silicon Dioxide, Vitamin B12, Manganese Sulphate, Betacarotene, Riboflavin, Co-Enzyme Q10, Vitamin D3, Artichoke Extract, Copper Sulphate, Grapefruit conc. Extract, Folic acid, Tartaric acid, Sodium selenate, Disodium Edetate. Seek professional advice before using if you are pregnant, breastfeeding, under medical supervision or suffer from food allergies.Liverel should only be taken on a full stomach. 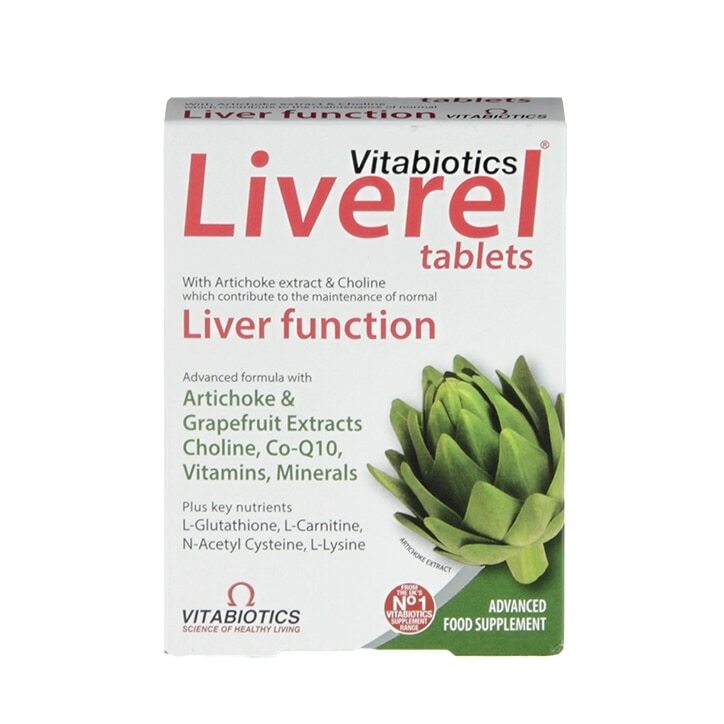 Vitabiotics Liverel Tablets is rated 4.5 out of 5 by 16. Rated 5 out of 5 by Jeannie m from PEACE OF MIND Dear Holland &Barratt, Thank you for my recent purchase of Liverel. As I had been diagnosed 20 years with liver damage, I have always tried to take utmost care ie being teetotal and taking healthy wholemeal foods, so this product is ideal to maintain my daily awareness of being careful. Thank you again.